ACCD has held a Training of Trainers (TOT) Regional Workshop entitled the "Inclusion of Arab Children with Disabilities in Education and Society" during the period 2-7 April 2016, in partnership and cooperation with AGFUND, LAS, the Arab Scout Organization, the Islamic Development Bank, the Islamic Educational, Scientific and Cultural Organization "ISESCO" and the Kuwait Fund for Arab Economic Development. The Workshop, during which the Guiding Manual on the Inclusion of Arab Children with Disabilities in Education and Society was implemented, aimed at preparing and rehabilitating trainers on raising awareness of the community, in general, and those concerned with inclusive education in the field of childhood, in particular, as well as to emphasizing the importance and possibility of the inclusion of Arab children in education and society. 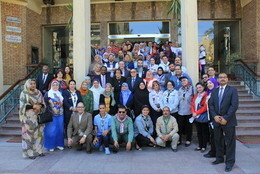 More than 65 trainees from 12 Arab countries (Jordan, UAE, Bahrain, Algeria, Saudi Arabia, Sudan, Kuwait, Lebanon, Libya, Egypt, Morocco and Mauritania) have participated in the Workshop, representing teachers and employees in education institutions, experts and workers in the centers specialized in caring for and rehabilitating children with disabilities in the Arab countries.